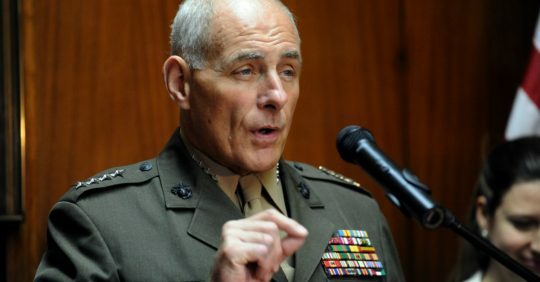 White House Chief of Staff John Kelly responded to Democratc Rep. Luis Gutiérrez's (Ill.) remarks that he was a "disgrace to the uniform" over the Trump administration's cancellation of DACA, saying Congress had done "nothing" for the "Dreamers" when they had the chance. "As far as the congressman and other irresponsible members of congress are concerned, they have the luxury of saying what they want as they do nothing and have almost no responsibility," Kelly said in an email to Fox News. "They can call people liars but it would be inappropriate for me to say the same thing back at them. As my blessed mother used to say ‘empty barrels make the most noise.’"
He added, "The congressman has a right to his opinion." DACA, short for Deferred Action for Childhood Arrivals, was the 2012 Obama administration executive order that shielded young immigrants brought to the country illegally from deportation. After the Trump administration's announcement last week to wind down DACA and call for Congress to pass replacement legislation by March, Gutiérrez issued a withering statement about Kelly, a four-star retired Marine general and Gold Star father. Gutiérrez, a member of the Congressional Hispanic Caucus, claimed Kelly went back on his word to protect DACA while serving as Secretary of Homeland Security. "General Kelly is a hypocrite who is a disgrace to the uniform he used to wear," Gutiérrez said. "He has no honor and should be drummed out of the White House along with the white supremacists and those enabling the President’s actions by ‘just following orders.’"
Gutiérrez, who has never served in the military, did not apologize for the remarks, saying Kelly "supports Donald Trump's xenophobic, racist policies." "Every DOJ and DHS lawyer says DACA is unconstitutional. Every other legal scholar – right and left – says the same thing. Trump didn't end DACA, the law did. That said, I worked and succeeded to give the congress another six months to do something. I am not confident," he said. "During my time at DHS – from 20 Jan until this moment – I have met with hundreds of members on both sides of the hill … My [message] always was ‘I have bought you time to do something on DACA.’ I begged and pleaded with them. They did exactly nothing." House Minority Leader Nancy Pelosi (D., Calif.) said last week that Trump would sign a bipartisan passage of the Dream Act, which would grant permanent legal status to eligible illegal immigrants. This entry was posted in Issues and tagged Donald Trump, Illegal Immigration, Immigration, John Kelly, Nancy Pelosi. Bookmark the permalink.